We’re back with the second consecutive year of officially losing our minds, but they say the first step toward healing is recognizing the problem. As of 11 am EDT on Monday, there were 345 hours until tipoff of four games of actual, it-counts college basketball on Opening Night, Nov. 8. 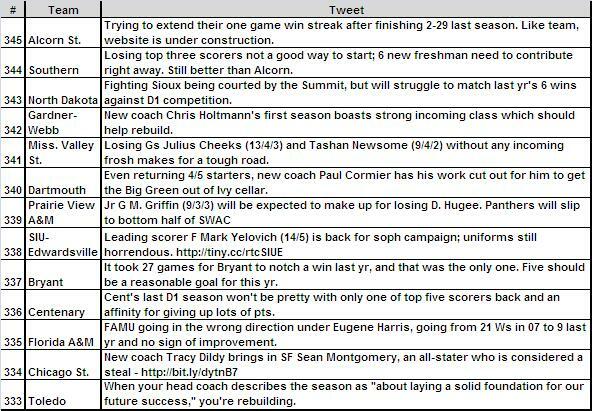 So… beginning yesterday morning, we started releasing our rankings of every Division I team from worst to first as tweets on the social networking platform known as Twitter (you may have heard of it). We’ll release one team preview every single hour from now until Opening Night, and in case you’re not following us over there, we’ll put the updated list here each night for your review in aggregate. 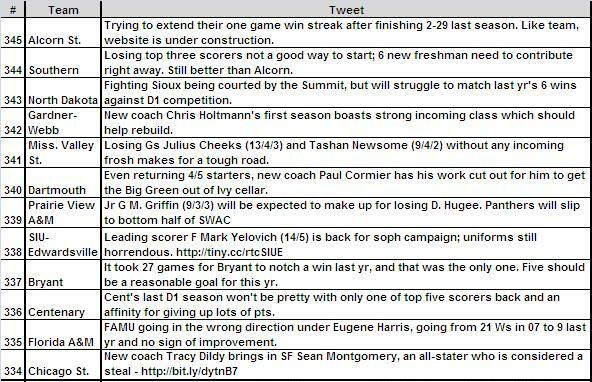 The key to tweeting, of course, is conciseness, so we’ll try our best to relay some relevant information on each and every team in the requisite 140 characters or less, and hopefully some of you will be paying attention along the way. Here are Monday’s entries (#345-#333). This entry was posted on Tuesday, October 26th, 2010 at 3:55 am by rtmsf	and is filed under 2010-11 Season Preview, tweeting the preview. Tagged: twitter. You can follow any responses to this entry through the RSS 2.0 feed. You can leave a response, or trackback from your own site.